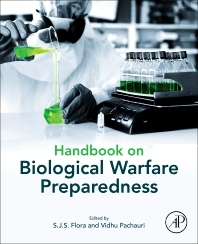 Handbook on Biological Warfare Preparedness provides detailed information on biological warfare agents, their mode of transmission and spread. It also explains methods of detection and medical countermeasures, including vaccine and post-exposure therapeutics, with specific sections detailing diseases, their transmission, clinical signs and symptoms, diagnosis, treatment, vaccines, prevention and management. This book is useful reading for researchers and advanced students in toxicology and the aspects of biological warfare agents, but will also prove helpful for medical students, civil administration, medical doctors, first responders and security forces. As the highly unpredictable nature of any event involving biological warfare agents has given rise to the need for developing rapid and accurate detection systems, this book is a timely resource on the topic. 30 years of experience working on Chemical and Biological Warfare agents and has contributed immensely in the field of heavy metal toxicology. He also has served as head of different projects related to research on biological and chemical warfare agents. Awards/honors: awarded prestigious Dr Kailash Nath Katju award of Madhya Pradesh Government in the year 2003 and Shakuntala Amir Chand award of Indian Council of Medical Research in 1995. He has also been conferred with prestigious Prof. Govinda Achari, Prof. S.B. Pandey and Prof. R.C. Dalela ORATIONS and was awarded Distinguished Scientist Life Time Achievement Award of Society of Toxicology (SOT, India) and Association of Biotechnology and Pharmacy (ABAP), Archana Gold medal of Academy of Environmental Biology (AEB) for his contribution in the area of Toxicology. Dr. Flora was awarded “Best New Technology Award” of Defence Research & Development Organization (DRDO) for 2009 for developing a new and perhaps the first chelating drug in India which may also be the only therapy for chronic arsenic poisoning. Dr Flora is a Board Member of International Society of Dietary Supplement and Phytomedicine (ISDSP), Rome, Italy. Earned his Ph.D. in 1985 from Industrial Toxicology Research Center, Lucknow, India and was a postdoctoral research fellow at Utah State University, USA. Fellow of National Academy of Sciences (India) (FNASc), Association of Biotechnologists and Pharmacy (FABP), Academy of Environment Biology (FAEB) and Society of Science and Environment (FSSE). He has delivered more than 150 invited lectures in India and abroad and has chaired many scientific sessions. Director National Institute of Pharmaceutical Education and Research (NIPER), at Central Drug Research Institute and Raebareli. Dr Vidhu is senior research fellow at Defence Research Development Establishment, Inida, and lecturer at Dr. D. Y. Patil Institute of Pharmaceutical Sciences & Research, Inida.